So here is a tough question for you guys. I am acquiring parts now for my VH2 replica. Off to a good start with a vintage Charvel Model 2 body and an all maple Squier II Strat neck. But here's the question: Which version of the Bee do I make for my permanent collection? I will probably do the reverse zebra touring humbucker. Even though the Bobbin was clear, it looks cream. So I'm torn here on getting a reverse zebra or a just a cream. I think I will just go with a standard tremolo. My 1983 replica has the full blown Floyd Rose and that's good enough for me. That's probably a no-brainer, unless I come across a crazy eBay find or maybe want to upgrade it down the road. The neck is where I'm just going to probably go out on my own. I think I will paint the headstock black and do the Charvel logo -- but there is no way in hell I would EVER paint the back of a neck. I am NOT going to do that, not even for authenticity's sake. So maple fretboard, unpainted back of the neck, and just paint the headstock. It really depends on how accurate you want to go. I think you probably have an idea of how far you want to go in your head. My '78 replica (still in progress at my tech's shop by the way) is as accurate as I could possibly get it in most ways, but my own preferences were put into my replica that have very little to do with the original '78 Franky. For example, I used a new Fender-spaced Dimarzio Super Distortion for the pickup. This aligns with the pickup magnets perfectly, so there is no need to slant the pickup at all...therefore, rather than slant it ever so slightly as Ed did on the '77-'78 version of the Frankenstein, I chose to do a straight, non-slanted rout and I made the rout in my black pickguard straight. This is totally inaccurate to ANY iteration of the Frankenstein because Ed never used Fender-spaced bridge humbucking pickups of any sort in the Franky and probably not in any other guitar of his for that matter as far as I know. Another of my little changes that is wildly inaccurate to the '78 involves the decal I chose for the headstock. I did not want to use the Gibson decal as Ed did...instead I chose the earliest 1 5/8" Charvel decal in gold (exactly as you see it on the Bee-the first guitar to have a Charvel decal)...this is a MAJOR inaccuracy that is peculiar to what I particularly wanted. I also chose to use Sperzel locking chrome tuners instead of the "D" logo 70s Schaller tuners that Ed used. Again, another inaccuracy that is all about my own preference. There are other things that I did that deviate from the original '78 Franky specs as we all currently understand, but I know you get the idea. This is absolutely your guitar, so do with it what you want, but I like the double cream Dimarzio Super Distortion in a Bee.This was the pickup that stayed in the Bee for most of it's life. The clear bobbin pickups are scarce as hen's teeth (though I know jimi has at least one of them! )...and Ed never used the guitar with the clear bobbin pickup live. It was just in for the album cover shoot. Last edited by garbeaj; 03.27.14 at 11:55 AM. It does sound different for sure, ,tut it could be a lot of factors I guess. The amp/cabinet, speaker, mic, etc. but in all the studio pics I've seen from the Zlozower session, all you see is the Franky, Shark, the single cutaway Dano resting on his Marshall, and the unfinished Strat with the Dano neck. Granted this is one day of shooting (most likely), it's not definitive proof and who knows if they were even recording on the day the pics were taken, but I also remember an old interview in either GW, or GP talking about the guitar, where Ed said that he had just recently got it from Charvel, and either had it apart, or was changing pickups...something to that effect. I remember him saying specifically that he just slapped it back together to make the photoshoot because he loved the way it looked, and that the pickup wasn't even connected at the time. 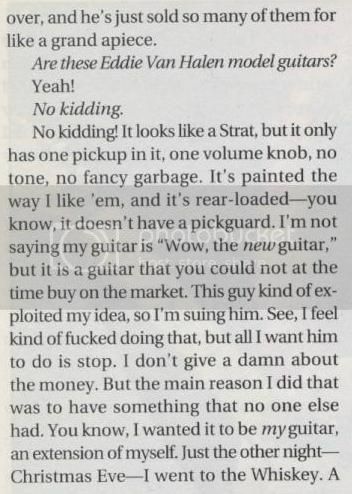 In the interview, he also mentioned this was around the time period he started swapping pickups more frequently trying to perfect the sound he was going for, so he could very well have changed pickups in the Shark. I know he tried different Gibson PAF's, Dimarzios, and Mighty Mites at different times between VHII and WACF in various guitars, including the franky. This is just an assumption on my part, but given how quickly they worked in the studio, (wasn't it only two weeks at the most or something for VHII?) I think he'd still have used the Frank and Shark primarily. I don't recall any Dano sounding guitar on VHII either, but pretty hard to say if this guitar made it to the album. Personally don't think so these days, but when I was younger, I assumed it was for sure. Last edited by we die young; 03.28.14 at 06:37 AM. ...so, the guitar was available to him during the time of the actual recording sessions. Now, did he use it for any of the VHII tracks? Who knows? I'm of the opinion that the main factor in the different sound from the first album is that I believe he was using a Mighty Mite clone of the Dimarzio Super Distortion or an actual Dimarzio Super Distortion for the first album. By the second album, I believe he may have switched to the re-wound P.A.F. that he always claimed was in the Frankenstein...this could also have been a P.A.F. style pickup that was custom wound by Seymour Duncan at that time. To me the first album has the Super Distortion "sizzle" that we all recognize from the first album. 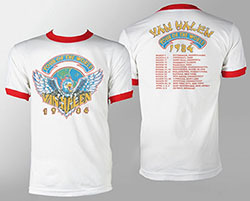 Van Halen II seems to have a more P.A.F.-ish sound to it. As far as I have been able to tell...he may have used the chopped "Shark" Destroyer on the main rhythm track of "Dance the Night Away" and I feel almost certain that he used the "Shark" on "Outta Love Again". The ultra wide bends and lack of tremolo work on that track tell me it was very likely done with a fixed bridge Tune-O-Matic style guitar and I believe it is the "Shark". I play 'Outta Love Again" using my vintage '76-'76 Ibanez Destroyer and it works perfectly and sounds right to my ear. The natural finished guitar with the Danelectro neck and the strat-style pickup configuration (with Tele pickup in the bridge and the red phenolic Might Mite pickup-that probably later wound up on the Franky-in the neck position) was used to record the intro to "Women In Love". Jimi hipped me to this years ago, and it was like a light bulb went off in my head. I quickly recorded my own version of the intro using my standard strat with the "Mark Knopfler" out of phase sound with the bridge and middle pickups selected and lo and behold, there was the sound, or at least my own approximation of the sound. This guitar was only used to record this intro and never made another appearance again as far as I know. Last edited by garbeaj; 03.28.14 at 08:48 AM. I think that is EXACTLY what I'm going to do. Committing to the Floyd is a big question for me though at the moment. Otherwise, mine should be identical. I'm just going to paint the headstock, no way I'm painting the neck. That's just ridiculous. I'm going to see how close I can get to replicating the Charvel logo, but will probably go with the sticker. Thanks everyone. Love this thread. 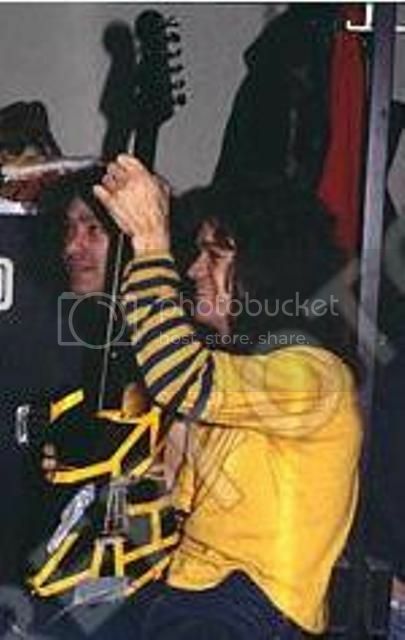 so, the guitar was available to him during the time of the actual recording sessions. Now, did he use it for any of the VHII tracks? Who knows? Based on his quote that he just slapped the clear pickup in for the photo shoot leads me to think that he just did not use it to record any of the songs on the album. That, though, leads to the question about what day the shoot was. Did they shoot before the album was finished? They could have. Truth is, we'll never know. I doubt anyone of them even remember. It's a shame that yet another one of the greatest deliberate falsehoods of VH legend was Ed knocking the guitar only because Grover pissed him off. He was mad at Grover -- there was never anything wrong with this guitar. I would think that it probably played just about exactly the same as Frank, so not that big of a deal to him at the time, I'm sure. Wait, the shoot was CLEARLY before they were finished recording because Dave has a cast on in the studio photos. But why wouldn't the Bee be in those shots? Ed never liked the way the guitar sounded hence why he stopped using it after the second tour. I don't believe it was anything other than that myself. He never recorded with it, and there is an interview somewhere he said he just used the Frank and Ibanez like on VH1. But why wouldn't the Bee be in those shots? But the fact remains, the Charvel VH II was available for use during the VH II recording sessions. Brett, he used it for three consecutive live tours: 1978, 1979 and 1980... he stopped using it after he had a blow out with Grover over the fact that Grover was making VH II style guitars without his permission. ...it was in the studio for the WACF sessions. Last edited by jimi11580; 03.28.14 at 10:58 AM. That sounds fantastic. Awesome job on that. Brett, he used it for three consecutive live tours: 1978, 1979 and 1980... he stopped using it after he had a blow out with Grover over Grover making the VH II style guitars without his permission. Yeah I remembered he used it in 80. But I know he didn't record with it, wish I could remember that interview and where I read it. And the interview I'm talking about was specifically about VH2. And just because he had it in the studio doesn't mean he recorded with it. Jimi -- you are the over-the-top king, my friend. Awesome photo of Bee in the studio.